The other day, I caught a glimpse of something that puzzled me, so I harnessed Dallas up for a walkie to get a closer look. Further inspection revealed it to be the outline of a man with sloping shoulders, rounded body, and short neck. Concentric circles (really ovals) containing numbers let you determine how well you’re aiming, assuming your goal is to hit the red circle in the middle of Mr. Yellow’s chest or head. The puzzle is, Why was a target-thingy like you might see on CSI posted on a utility pole in the middle of a peaceful neighborhood in small-town Illinois? There were no holes in the poster, unless you count the nail marks holding it in place. That tells me nobody had been tossing darts at Mr. Yellow. Nor had they been throwing knives. Or slinging arrows. And there wasn’t a single bullet hole on his person either. Now I’ve no problem with target practice. It makes sense that if one’s going to own a gun, one should know how to use it. But we have a firing range, and it’s NOT in the middle of a residential area! I think it’s illegal to shoot a gun in a neighborhood. Miss, and you could kill someone; hit the mark, and the power could go out. So the writer in me wonders if this might be a sign. A warning. A threat, even. Like somebody has it out for somebody and is letting them know they’ve been practicing, or that the other person should start practicing. But why choose this pole for Mr. Yellow? Did other poles have similar targets which were removed? Do other neighborhoods have target posters? So many questions but I’ve got no answers. 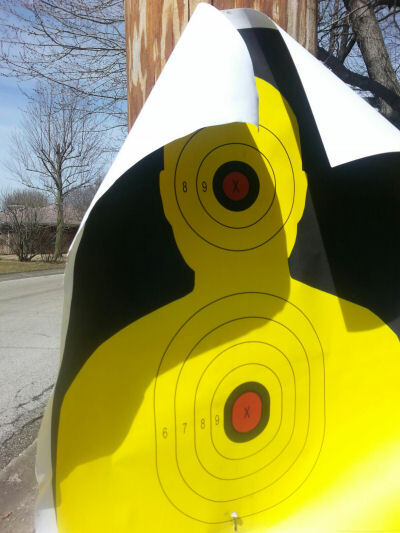 This entry was posted in Uncategorized and tagged CSI perhaps, shooting, strange poster appears on pole, target practice, tossing knives or arrows. Bookmark the permalink. That is a really strange place to find a target! I wonder if some kids put it up as a joke. It sure makes people wonder. Your guess is as good as mine, Suzi! It was an odd place to find something like that, though. And gee, where would kids find a target practice poster??? Shouldn’t they be inside doing homework and stuff, ha?! That is a wonder! I’m not sure what’s up with that. I would guess someone was walking about and wanted to get rid of a target thing, so he hung it there. Imagine! OK, so let me get this straight. Somebody was walking around minding his own business, when he saw a pole and decided to unload a rather large target poster? Well, I guess that works for me. But he must have had some idea he was going to do this because he had to bring nails and a hammer, right?! Thanks for sharing your thoughts, dear Professor! *laughs* Okay, that might sound a bit…well, a bit silly. But still. It’s something I might do. You might?? *grins bigly* Well, if you say so. I guess carrying around a hammer might be a good thing, even if you’re not a tool guy — never know when something like that might come in handy! I am of no help, Debbie. Disconcerting, for sure. I’d have wondered if someone was watching to see if anyone would try to dispose of it. Be careful in that sweet quiet neighborhood of yours. Shudder. Audrey, you’re a sweetheart for fretting over my little self! I found it a puzzle, for sure. When I drove past where it had been posted, though, it was GONE! Can you imagine? I don’t know whether to be even more worried, ha! I would be suspicious, for sure! Good grief! Me, too! It’s a puzzle. I haven’t heard any of the neighbors mention it, so I’d probably think I was imagining the whole thing — if not for the picture, ha! Oooo…Debbie, I never even thought of that. The writer in you is so imaginatively creative because that would make for a VERY suspenseful story! The first thing I thought when I saw the photos was perhaps some kids put it there and were planning to use it to practice shoot with a BB gun, but then never did. Whatever the story is, it’s very mysterious! Hope you had a great Wednesday, my friend. Can you believe how fast this week is going? I suppose kids could have left it there, but they’d have had to be pretty tall since the top of the poster was over my head. Hmm, this one is likely to remain a mystery, and you’re so right — truth is stranger than fiction!! Happy almost-end-of-the-week to you, dear! I don’t know. That’s awfully strange. I hope it’s just a joke, but I can’t get past your idea that it might be a warning to somebody. I hope not! I might never know now, Terri, for the doggone thing has disappeared! I wanted to take another look to see if I’d missed something, and when I went back, it was nowhere to be found. Now I don’t know whether to be MORE concerned than before! Thanks for sharing your thoughts — I’d like to think it’s somebody’s idea of a joke! Actually, it’s rather a clever move. It’s a clear sign to “bad people” that someone in the neighborhood might just know what that target’s for. The only thing is — which lovely householder might it be? That thing could protect your whole neighborhood. I did have to laugh. I have a friend who got her concealed carry permit a couple of years ago. She goes down to the gun range regularly, to practice and increase her skills. She brought home a target one afternoon — one with several nicely placed shots — and hung it in her garage, next to the door into the house. As she says, no one is going to pay a lick of attention to a sign that says “this house protected by whatever”, but the target might make someone think twice. Linda, I got such a kick out of your story! What a feisty young woman your friend is — and I imagine she’s spot on, too. Every “bad person” knows you can get stickers and yard art proclaiming your premises are protected by some security company or other; a well-used target, however, is another story. I’ve always liked Texas’s slogan, Don’t mess with Texas! Doggone it, now the target-thingy has vanished, and suddenly I’m wondering why. If it was designed to protect the neighborhood, you’d have thought they’d have left it where it hung. Perhaps some well-meaning person yanked it down. I suspect at least a few of us have guns at the ready anyway, ha!! A sock or dishes wouldn’t be too terrifying, Christy, ha! This target-thingy aroused my suspicions, and I’m still not sure whether to be glad it’s been removed or not! You nominated me for a challenge? How sweet of you! I’m going to follow that link right now and see what’s involved. Thanks for thinking of me! What a good friend you are! Good for you, Janna. 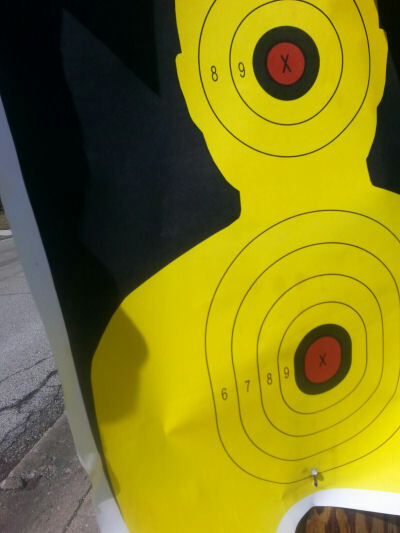 I’ve always thought target practice and gun safety are important skills to manage! I can rest easy now, knowing the target has been removed, right? Or, as my writer imagination cautions, maybe now is the time I should start to worry more, ha?!! Creepy. When everyone feels like a sitting duck, do we really another target to remind us of all the dangers out there? I hope you tore it down. Pat, I was afraid to tear it down! I didn’t know who put it up there, and the writer in me could practically see eyes watching me even as I took a picture of it! I’m glad it’s finally down, but yes, it was creepy indeed.